Fancy giving your patio a unique look? You could pave it with Nintendo Gameboy bricks. 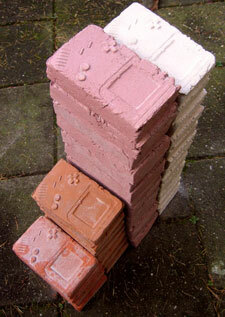 Yes, these are shaped like old ‘brick’ Nintendo Gameboys, the work of an obsessive Dutch Nintendo fan who wanted to pave his drive with Gameboys. And once he’d mastered that, he decided to sell them on to anyone else who fancied a quirky drive/patio. The one downside of it is the price. A brick – heavy that is it – doesn’t come cheap via mail order. Which means an asking price of just over 31 Euros per brick. Multiply that for a drive and you’re talking serious cash – so maybe just buy a few for a feature area.